Every GlueHeads exhibition is curated from different artists working with different collage techniques. In order to make every exhibition/zine unique and to keep the concept fresh, every GlueHeads session is always held in a different gallery with a whole new set of artists. On a same day, a compilation zine is published consisting exclusively of collages made on the day. The ambition of the GlueHeads zine is not only to document these ephemeral works, but in consideration of the zine medium, to also be considered as substantial and comprehensive work in itself. A project curated by Anelor Robin. 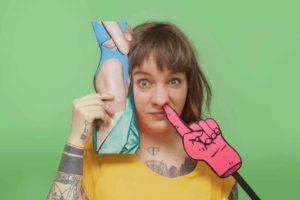 She is a freelance curator/artist from France based in Berlin. She considers the exhibitions she has presented to be a massive collage of different artistic elements. Regardless of the assembled work’s origin, age, or medium, she considers it’s her obligation to always find the best possible permeation of artists and artworks. Collage, to her reasoning, is the base of all art and creation. You are cordially invited on December 23rd to see the result of 2 intensive collage work days and see a unique copy of GlueHeads’ zine.